This is a really hard issue for parents... when apparently, it's a non-issue for kids! I relate to this post a lot, as my autistic 10-year-old has some interests that are definitely in the preschool realm. But I gave up worrying about "how it looks to others" a long time ago. He is who he is - I'm just happy he's into SOMETHING! (I remember the days when there was absolutely nothing in his life that sparked him.) So be grateful for what you have. It could also be a bit of a comfort item as he was headed to a new place. I totally understand where you are coming from. As much as I would love for my son to "fit in", he just isn't going to. The non-verbal and no desire for friends are the biggest reasons. 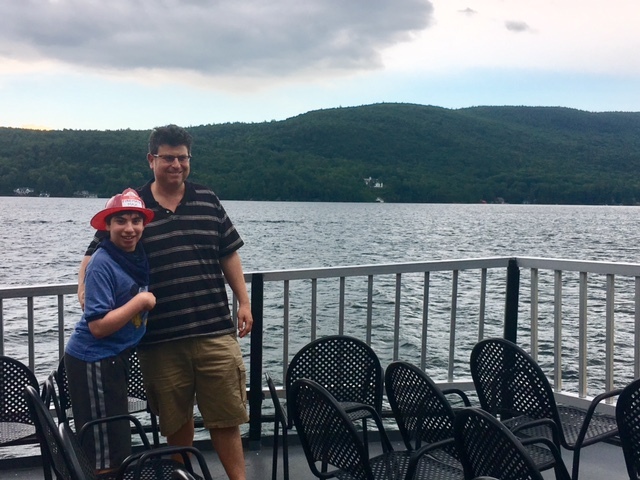 At his daily summer camp program (for youth with developmental delays) there are lots of high school (at least 17) and college age staff that he loves to do things with. But he doesn't have a favorite. At home one of his most very favorite things to do is to color the driveway with chalk. He can easily go through 4 boxes in a weekend - so the driveway is COVERED :-) Not a typical sight to see a 14-year-old, 5'5" boy laying on the driveway doing chalk. But he loves it, the neighbors love it (we often get surprise gifts of chalk). Now if I could just figure out how to keep the dust out of the house. We had a little of this over the weekend. At the local pool our 14yr old son longs to be in the fun kiddie area and we don't have a problem with that but now that he is 5'4 it is frowned upon by the lifeguards. How confusing it must be for him and others. This growing up thing just gets harder and harder. as the parent of a child who isn't yours, I would have no issue with him being in the kiddy area as long as he was being gentle with the littlies. I think the analogy with a typically developing child is worth pursuing. When and why do we try to guide our typical kids on grooming/what they wear? There's physical needs (warmth, closed toed shoes, socks, . . .), social appropriateness (i.e. hats inside, length of skirts, suits, no flip flops, . . . .). There's cleanliness (deodorant, combed hair, clean clothes), grooming (hairstyle, eye brows, lipstick, shaving). And there's impressions -- a t-shirt with a slogan, political view point. Clearly we all argue all of these things with our children. When do we insist? I think the only difference you might encounter with Max is whether he needs more guidance on understanding the impression he will make when he wears the fireman hat. For example, it might decrease the number of 14 yo who talk to him while increasing the number of adults -- is that OK with him? 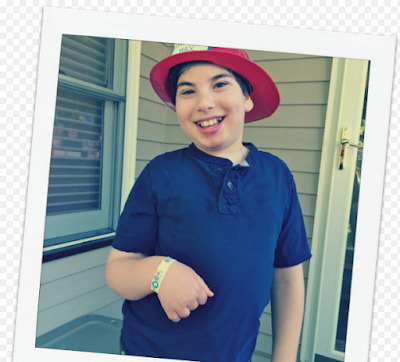 The camp Max is attending is for kids with special needs/disabilities. His previous and new schools both are too. Additionally, if it makes him happy who is to judge? I know how kids are, I was one myself not that long ago, but I believe the problem is not Max wearing the hat but rather kids thinking it is okay to tease someone based on anything including how they dress, ESPECIALLY when it is clear that the person has special needs/a disability. I haven't had to deal with this with my kids because they're so little still, that things like this wouldn't be a big deal. But I recently volunteered at our church's girl's camp a couple weeks ago and there was a girl with a ID of some sort who carried a stuffed unicorn around with her everywhere and it was totally an issue of it being a bigger deal to everyone else than it was to her, or her mom, who was the camp nurse. I think it's a good way to talk about disabilities to people and explain that for some people these are objects of comfort. I am dealing with this at the moment. My daughter is 11, in her last year of primary school and we are in Australia. She is autistic, but appears to be a perfectly normal but hyperactive child to those who don't know her. Her interests are dolls, and has recently discovered a doll puppet. Her teacher pulled me aside and said the perhaps she shouldn't bring it to school, as he was worried about the other kids teasing her. As it happened, one of the kids in her class did tease her about it. She told me that she was going to continue to take it to school, because the little kids liked it and she liked making them laugh. She said she doesn't care if the other kids pick on her, because she is who she is. I told her I was proud of her, because it takes a lot of guts to be who you are when other people don't like parts of you. I'm not about to tell my child she has to fit in with what society deems she should be playing with an acting like. Why does Max not wear his helmet to school? It's probably against the dress code. Most schools do not allow hats unless they are for medical or religious purposes. I feel you exactly. Every situation, family and child is different and I'm glad to see thoughtful, reasoned debate, no flames above! In a similar position I would encourage the firefighter ball cap option and gently transition over time. Just my input as it would relate to MY kid (well, she is now 21!!) My reason is that she is highly social and WANTS to engage with her peers, so I gently push her in the direction of looking like she fits in. Example - he has gorgeous nails, so I invest in mani-pedi every few weeks as it is such a conversation starter. My typo...meant to say "she" has gorgeous nails!